*represents a UW pay raise from 2017. Note: Listed salaries do not include potential bonuses. … Strength and conditioning coach Tim Socha is scheduled to earn $340,008 for the second year in a row. That salary in 2017 ranked No. 2 for strength coaches in the Pac-12. Washington co-defensive coordinator Jimmy Lake is now the highest-paid assistant coach in program history after signing a three-year contract extension worth at least $1.1 million annually to remain at UW. Lake’s salary is believed to be the second-highest among assistant coaches in the Pac-12, behind only Oregon defensive coordinator Jim Leavitt, who is scheduled to earn $1.7 million this year. One of the most sought-after assistants in the country this winter, Lake, 41, signed the extension in December after co-defensive coordinator Pete Kwiatkowski voluntarily ceded play-calling duties to keep Lake at UW. The school released Lake’s contract, among others, to The Seattle Times in a public-records request this week. Lake, a former standout defensive back at Eastern Washington University and a graduate of North Central High School in Spokane, earned about $650,000 in 2017. The buyout language in Lake’s contract makes it unlikely that he would leave UW to be a defensive coordinator at another college program. A rival Pac-12 program would have to pay a $2.2 million buyout to UW – the full amount remaining on his contract – to hire Lake as a coordinator after the 2018 season. It’s extremely unlikely that any program would be willing to pay that much for that position (and maybe not for any position). Any program outside the Pac-12 would have to pay UW $1.1 million – half of what’s remaining on his contract – to hire Lake as a coordinator after the 2018 season. Lake, however, could leave UW without penalty to be a head coach (anywhere) or to be an NFL defensive coordinator. Kwiatkowski, 51, who will still remain heavily involved in game-planning and play-calling for the UW defense, has also signed a three-year extension this winter that expires on Jan. 31, 2021. He received a $25,000 raise for 2018 – up to $900,000, with additional raises that will bring his guaranteed compensation to $1 million for 2020. Bush Hamdan, UW’s new offensive coordinator, will earn $700,000 annually as part of his three-year deal. That’s the same salary Jonathan Smith earned as UW’s offensive coordinator in 2017. Among the Pac-12’s 10 public schools, the Huskies had the largest salary pool for assistant coaches in 2017, at about $4.68 million. That figure ranked No. 9 nationally, and represented a significant bump from UW’s 2016 salary pool of $3.54 million. UW’s salary pool for 2018 is about $5.44 million, which would rank No. 5 nationally based on last year’s figures gathered by USA Today. Alabama, with a $5.99 million salary pool, ranked No. 1, followed by LSU ($5.9 million), Clemson ($5.7 million), Michigan ($5.6 million) and Florida ($4.99 million) in the top five. 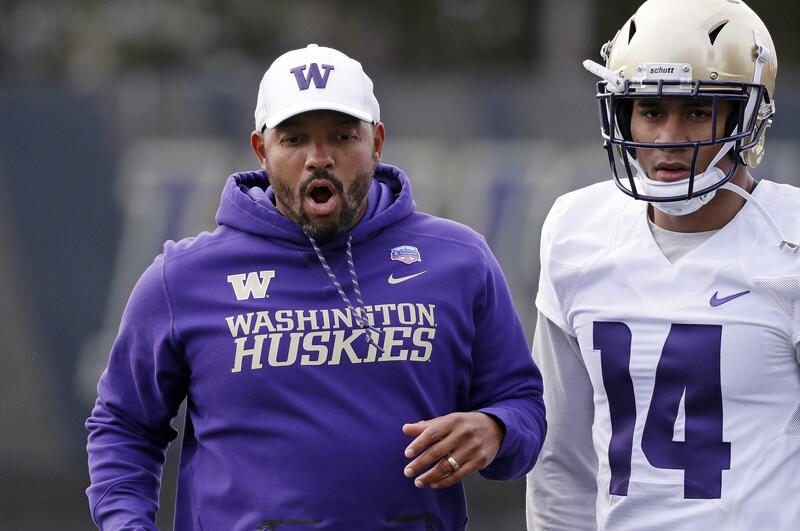 UW’s 2018 pool includes a $200,000 salary for defensive backs coach Will Harris, who in January was added to the staff after the NCAA approved a 10th on-field coach for major-college programs. Published: May 10, 2018, 11:29 a.m. Updated: May 10, 2018, 4:20 p.m.